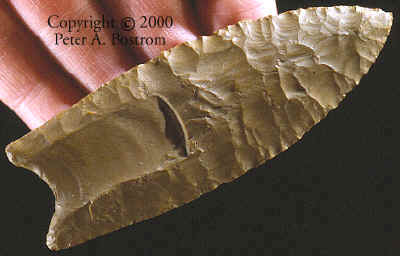 This finely crafted fluted point was discovered in 1980 along with nine other similar projectile points at a presumed kill site approximately 250 m west of the Vail Paleo-Indian encampment. This specimen (V.5581) was presumably lost during a hunt for caribou moving along the Magalloway River Valley, upwind of the Vail habitation site. Radiocarbon dates from the Vail site indicate that this hunt took place 10,500 to 11,000 years ago. 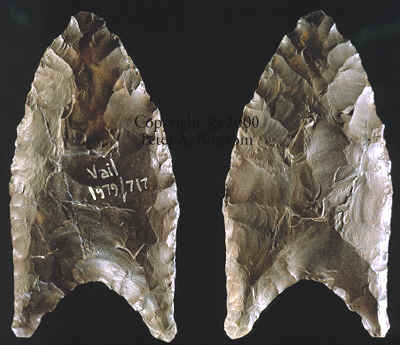 Compared to other fluted projectile points found upon the Vail site, V.5581 has a relatively shallow basal concavity, although in all other respects it is typical of the Vail form of fluted point. The edges of the point are dulled by rubbing (grinding) as far as the termination of the shorter channel flake. Both the point of balance and the maximum width of the point lie just forward of the shorter channel flake. The longitudinal cross-section is regular with no suggestion that the point was resharpened. The raw material of V.5581 is yellow-brown chert, commonly termed "jasper". Its source is unknown, and it may have been transported from a considerable distance. 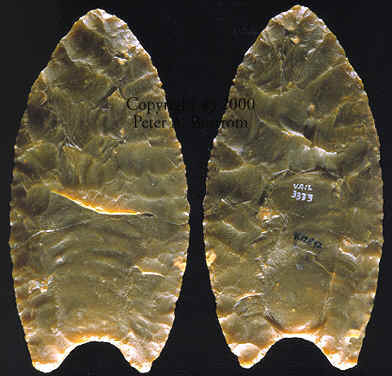 Debert "fluted" points were named by George F. McDonald in 1968 for examples found on the Debert site in central Nova Scotia. These deeply concave base points are found mainly in Nova Scotia and Maine. 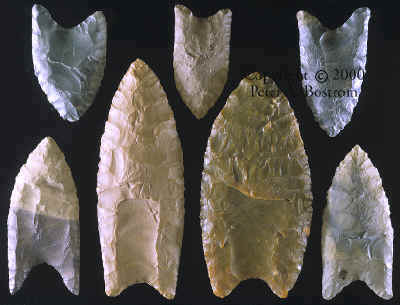 Many of the fluted points found on the Vail site are classic examples of Debert points. The bases with long delicate "ears" are similar to bases on many Dalton points. This Debert/Clovis point, number V.5581, measures 3 7/8 inches long. Photos Courtesy Mike Gramly Ph.D. This is pictures shows some of the fluted points found on the Vail site. Both of the points at each end in the bottom row were found broken. The bases were discovered in the campsite area and the points were found in the presumed kill site area. Note the different colors of the broken bases (purple--left side and gray--right side). This small heavily resharpened fluted point was found on the Vail site in 1979. This was probably the second best example of all the fluted points found on the Vail site. It's thin and very well flaked.